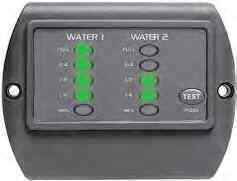 The 600-TG offers economical monitoring for fresh or grey water tanks (plastic or fibreglass only). Using 600-TGSK strategically mounted well nuts will give 4 tank levels. Supplied with one sender kit. Second sender ordered separately. Also available is the RV-TS-5M Tank sender. Only one hole is required for installation, the sender is sealed via external lock nuts. Suitable for tanks with maximum depth of 280 mm. • Well nut hole size 3/8" (9 mm). • Cable length 5 m.
• One kit supplied with 600-TG.